Berenike I was Queen of Egypt by marriage to Ptolemy I Soter. 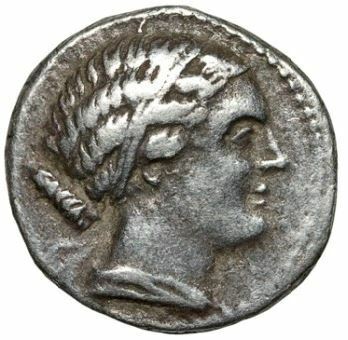 She became the second second queen, after Eurydice, of the Ptolemaic dynasty of Egypt. Berenice was originally from Eordeaea, and the daughter of princess Antigone of Macedon. Her maternal grandfather was a nobleman called Cassander who was the brother of Antipater, the regent for Alexander's empire. After the death of her first husband, Berenice travelled to Egypt with her children as a lady-in-waiting for her mother’s first cousin Eurydice who was the wife of Ptolemy I.
Berenice became involved in a relationship with Ptolemy I, who married her in 317 BC. She was the mother of Arsinoe II, Philotera and a son Ptolemy II Philadelphus. In an unknown Olympiad, she was a victor in the chariot races.